The Craven Pothole Club was founded in September 1929 as an offshoot of the Craven Naturalists and Scientific Association. It came into being in no small measure due to the vision of Albert Mitchell, a Skipton man who, prior to 1929, had gathered together an informal group of like-minded friends to explored some of the easier caves and mines of the district. The young CPC had few members and even fewer resources and could only tackle some of the easier potholes using handlines. The bottom of Alum Pot was reached via Long Churn in this manner, hand-over-hand on manila ropes. A later attempt on the 140 feet entrance shaft of Rift Pot ended in near disaster and convinced the early pioneers of the urgent need for rope ladders. Very soon the club gained the expertise to make these and went on to explore all the classic potholes of the district. The first ladders were about 28 feet long and made from ash rungs and cotton canal hauling rope approximately 1 inch in diameter. 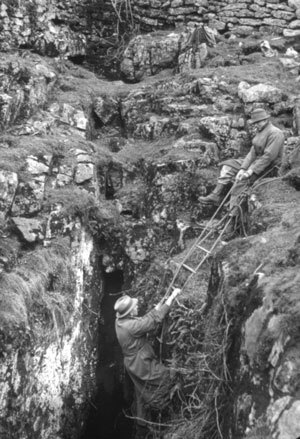 In 1931 the Club made its first rope ladder descent of the 340 foot deep Gaping Gill Hole, returning in 1932 with a rudimentary windlass with which to lower people into the Main Chamber. Excepting the war years and the Foot and Mouth epidemic of 2001, the club has held winch meets at GG ever since. In 1932 a team of 24 achieved the first ever exchange of parties between Alum Pot and the notoriously wet Diccan Pot, at about the same time the tortuous Intestines route was found in Marble Steps. Three years later, following a two-year siege, club members accomplished the first descent of the Rat Hole entrance into Gaping Gill. The next year they made the second only descent of Nick Pot and first descents of Coronation Pot and Langcliffe Pot. During the first decade of its life the club went from strength to strength, its activities embracing mountaineering, rock climbing, archaeology, natural history, and skiing. The club was a founder member of the Central Rescue Corps the forerunner of today’s Cave Rescue Organisation. Cordial relations with the Wilcocks of Northcote Farm, Selside led to the CPC taking out a lease on Alum Pot, an arrangement embracing the provision of a wooden hut, and employment of a one-armed railway worker to collect entrance fees. His wages for a weekend were 7/6d. By the end of the War membership had reached 40 and by 1949 this had trebled, to include Dr Farrer of the Ingleborough Estate, Dr Arthur Raistrick, local historian and George Gill, owner of Stump Cross Caverns. The club soon had many major discoveries to its credit, both in the Dales and in Ireland, including an extension to Car Pot and the two mile long Pollaraftra with its many lakes, canals and superb calcite decorations. Other finds were made in Stump Cross Caverns and today the Greenhow area continues to be a focus of club attention, the most recent discovery being the Great Expectations extension in Stump Cross. A mammoth excavation begun at Tarn Sinks above Malham in 1948 achieved fame for its longevity, and was only abandoned in 1964 after reached a depth of 90 feet. 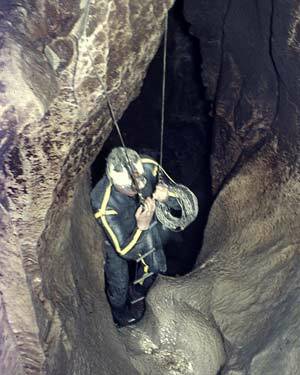 In 1956 Bob Powell became one of only two British cavers invited to participate in an international team that pushed the Gouffre Berger, to over 1000 metres, then the first cave to exceed this depth. Other important finds were made about this time, for instance New Goyden Pot, Providence Pot and the extension to Dow Cave. The latter ultimately led to the exploration of Dowbergill Passage, scene of many rescues over the years. Cherry Tree Hole and Darnbrook Pot were followed soon afterwards by Mongo Gill Hole, and the 200 feet deep Pollnacrom. The late sixties and seventies were like a second Golden Age in Craven. 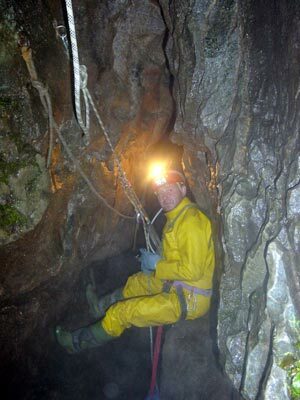 Of the finds made during this exciting time, perhaps most dramatic was the extension of Birks Fell Cave with it’s superb stream passage, 500 feet in depth and over two miles in length. Scrafton Pot in Coverdale, and the mile long Aille River Cave in Ireland were added during this period. In 1968 Ivy and Riverside cottages were acquired beside the Crown Hotel at Horton-in-Ribblesdale, where the club has in the intervening years built an amicable relationship with the local community. In 1971 a six man CPC team discovered important new caves 150 miles north of the Arctic Circle in Norway, and the following year saw club member Dave Judson lead the Ghar Parau expedition, almost half the team being drawn from the Craven. Three years later three members joined the first British Expedition to Papua New Guinea, finding the longest cave in the Southern Hemisphere. The following year the CPC were underground in Ecuador caving with Neil Armstrong, the American astronaut and first man to set foot on the moon. Other expeditions to have drawn personnel from the ranks of the CPC include ones fielded in the Philippines and Italy, as well as home-grown ventures to France, Sardinia and Macedonia. Most recently there have been expeditions to New Zealand (jointly with the Hamilton Tomo Group), and to an area of southern China (under the auspices of the China Caves Project). Other worthwhile finds include, Robinsons Pot, Jean Pot, Lizard Pot, Coppice Cave, Yew Tree Cave, as well as extensions to Gavel Pot, Sell Gill, Cherry Tree Hole, Yew Cogar Cave, Pillar Holes, Link Pot, Lancaster Hole and Gaping Gill. In 2004 the CPC celebrated its 75th Anniversary and to mark this important milestone we published a quality 200-page pictorial Jubilee Publication as a souvenir. A three-month long exhibition featuring the history of the CPC was shown at the Craven Museum, in Skipton.